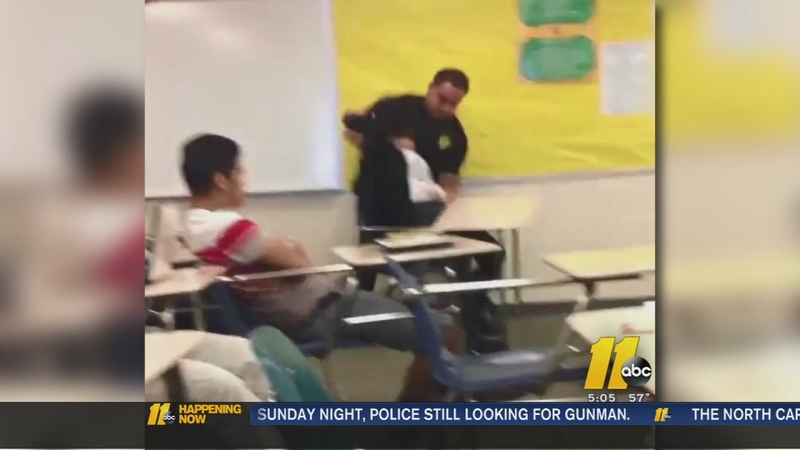 RALEIGH (WTVD) -- South Carolina school officials say a student flipped out of her desk and tossed across the classroom floor by a school resource officer and a second student who recorded the incident have been allowed to return to school. In addition, spokeswoman Libby Roof of Richland School District 2 says a substitute is teaching the class at Spring Valley High School in Columbia and the administrator who called the officer into the classroom is on paid leave. Authorities have said the 16-year-old was being disruptive in class Monday and wouldn't go to the office after she was caught using her phone in class. Richland County Deputy Ben Fields was fired, and the U.S. Department of Justice has launched a civil rights investigation. The two students face misdemeanor charges of disturbing schools. Meanwhile, there's a petition on change.org calling for the resignation of the view co-host Raven-Symone. More than 130,000 signatures have been collected. Symone sparked controversy when she partially defended the South Carolina deputy. ABC released a statement over the weekend saying "we love Raven. She is confident, genuine and opinionated, all qualities that make her a great addition to the panel."